Surrounded by lightweight mesh that promotes air flow and acts as an insect screen, this 3.5 pound travel bed folds AND fits into a carry on suitcase! The UV protection and anchor straps for ground attachment are welcome features for outdoor use. 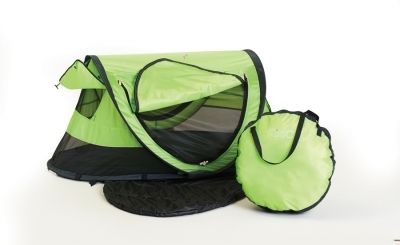 The PeaPod Plus comes fully assembled with a sleeping pad snapped to the underside of the floor. No further assembly is needed as it can be folded and stored with the sleeping pad fully attached. 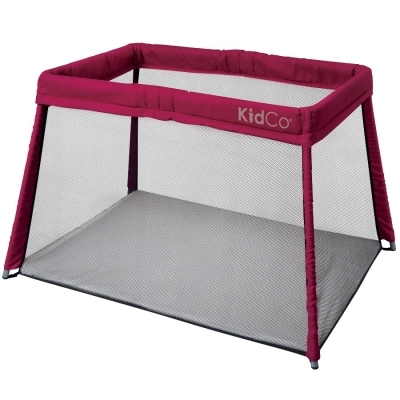 A large front zipper panel makes access to children easy. The PeaPod Plus is designed for use with children one to five years old and comes with a carry/storage bag. When open the PeaPod Plus measures 52.5”L x 34”W x 21”H. The storage bag measures 19L” x 3.5”W x 19”H. Available in Twilight and Kiwi. So light and easy to transport to brother and sister games! Love how easy this is to use, great color and airflow!